My littles have a joke they love to sneak in on me, on you, on anyone they can. They learned it from their friend during one of our summer adventures. L: Hey Mama, will you remember me always? Me: Of course I will. L: Will you remember me in an hour? L: Will you remember me in four hours? L:Will you remember me in a day? L: Will you remember me in a year? It’s a cute joke. I laugh every time they get me, because well, it tickles them and I have to laugh or I’ll cry over how easily distracted I am and how easy it was for them to get me. Again. The other day I saw this posted on Facebook. It’s a whole different, heartbreaking and very unfunny side of the forgetfulness. Alzheimer’s is definitely no joke. So many of us kid about having “senior” or “Old Timers” or even “Alzheimer’s” moments. It is said in jest with no mal-intent, but the pain and brokenness behind the truth of this disease is almost too much to comprehend. 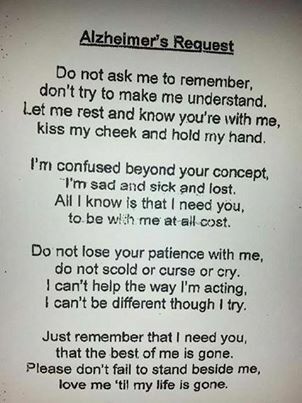 I remember meeting someone with Alzheimer’s twelve years ago when I worked for Hospice. The sweet and gentle man was lying in a hospital bed in a nursing home. Each morning very early, his wife of over fifty years came and sat with him. She did not leave until dark, which unfortunately was much earlier in the winter. She didn’t like leaving him that early, but she couldn’t drive after dark. Perhaps the saddest thing of all was that I am not sure he even knew she was there most of the time. And the sweetness and gentleness was fading quickly. It broke my heart to see her dedication and how much she loved him, as she watched what someone once described as having your favorite book be torn apart, one page at a time. We had been through it already with my great-great aunt, but I don’t remember a lot of the details. I mostly remember Mama talking about how she was doing things that were very uncharacteristic of her. Once a genteel Southern lady, she became aggressive and downright irrational at times. She too wound up in a nursing home before she left this world for a far better one. I have had this on my mind the past few days. Today four years ago we celebrated the birthday of my beloved aunt the day after her birthday. My zoo crew, Mama and Daddy, and I all went to see her. I had even baked a cake in the shape of a crown. She seemed to enjoy the day, which was joyful for all of us. Her memory had been slipping a little and though I don’t know that there had been a definite diagnosis, I suspect that Alzheimer’s had been tossed around. It was only a matter of time before we would have to make a decision about her living situation. She was in the house she had been in for decades, and she probably knew it better than she knew the back of her hand. It would be very hard to convince her to move, though it would have been for her own good. There is a special tint to the memory of that day. I look back through the lens of sentiment and sadness and gratitude. It was the calm before the storm. It was the last birthday we would celebrate with her, as she died peacefully in her sleep in her own home about eight and a half months later. Though we still miss her everyday, we are thankful she didn’t have to leave what was comforting and familiar for her. That day was also the last time we would do something like that as a whole family together. It was less than a week later that Daddy went into the hospital to officially begin what would be over two years of fighting against the giant that would later be named Lymphoma. Like memory loss and Alzheimer’s that one struck from out of nowhere and hit us hard. This is a hard world to be in at times. Sometimes we lose the folks we love suddenly, leaving us wishing for more time, for just a few more minutes to say what we left unsaid. And sometimes we lose the ones we love little by little, almost imperceptible from day-to-day, but it continues and takes its toll. Alzheimer’s is like that. One little bit of memory, of personality at a time. Lymphoma turned out to be the same way, only affecting the body instead. One skill at a time…..little by little. Tonight I am thankful for the memory of this day. I am grateful we had just decided to homeschool, and that my oldest was able to be there and also has the memory of this celebration. I turn back to this page in my mind often and the corners are soft and worn and comforting. The laughter, the visiting, seeing the joy and the spark in her eyes, how she oohed over the cake that was made especially for her, how Daddy took the littles outside, just like he always did–such a beautiful day, inside and out. Most of all, I am thankful for folks who are researching and studying both of these diseases, working so maybe fewer and fewer people will leave us this way. I get that it’s just a label to folks who have never known someone with it, and that’s understandable . But I also know that if you lose the people you love most to either disease, you will never forget it. Alzheimer’s Association http://www.alz.org/ Because September is Alzheimer’s Awareness Month, there are many “Walk to End Alzheimer’s” events going on this fall to raise funds and awareness. It’s not too late to get involved. The Leukemia and Lymphoma Society http://www.lls.org/#/ They have Light the Night events to raise funds and awareness as well. Right now you can buy a balloon for $1, $5, or more at Burlington, a partner with LLS, and the funds go back to LLS. We can all make a difference in the fight for someone’s life. I’m thankful for that too.